In April 2008 visitors to the Florida Hospital Medical Complex in Orlando, Florida, USA, crowded around a prayer garden window to witness an image of Jesus, which had miraculously appeared there. Russian Federation, says he can see other people's illnesses in the mirror.  India: Aubergine seeds spell out "Allah"
Green sky over Holy Land a sign of Second Coming?  Israel: Red heifer a sign from God?  Greece: "The fish are coming!" British Muslims are proclaiming a "miracle message" from God which was found written inside a tomato. Fourteen-year-old schoolgirl Shasta Aslam purchased tomatoes in the northern British town of Huddersfield. When she returned home, she cut two of the tomatoes into small pieces. "Subway Virgin" formed in a puddle of water in a Mexico City metro station.  USA: Did Jesus appear in New Haven, Connecticut? A variety of baffling phenomena are amazing people all over the world time and again. In July 1998 an enormous drawing of an Aboriginal man, beautifully drawn and proportioned, was discovered in the south Australian desert. Children are crying tears made of cystal, stone, thorns or producing gemstones or metal nails. A young Filipino manifests detailed images of the Christ, Mary, and others onto rose petals. In miraculous ways images of the Christ and the Madonna appear on buildings, in windows and other places. Hindus and Moslems all over the world are discovering holy signs which are formed by seeds in fruit and vegetables. A native American woman prays after completing a period of fasting. Since then her home has become a depository for a sweet-smelling oil that drips from the walls, ceilings, windows, mirrors, furniture and, most importantly, from herself. A young girl from Russia has x-ray vision, a young Hindu can look directly into the sun for hours, a Russian boy can see diseases through a mirror. In July 1998 an enormous drawing of an Aboriginal man, beautifully drawn and proportioned, was discovered in the south Australian desert, near Lake Eyre, 400 miles north of Adelaide. Visible only from 3,000 feet above, it measured three miles long, and was discovered after businesses in the nearest town, Marree, received anonymous faxes telling them of its presence. The figure - which became known as the Marree man - was drawn into the earth with a 20-foot-wide gouged line, which, from 3,000 feet, appears as a deep rust colour contrasting with the pale desert earth. The circumference of this line-drawing measures 10 miles. Experts say that it could only have been created with the help of satellites and even then it would have taken many weeks to complete the work. The mystery figure has produced much interest from the Australian and international media, and speculation about its creator is rife. While some people think it was a prank by the local community to attract tourists, others are suggesting it could only be the work of extra-terrestrials. 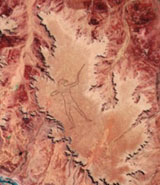 The figure is on a plateau near Finnis Springs, 40 miles west of the city Marree in Central Australia and has been fading into the desert over the years. The geographical coordinates are: 29°32'S 137°28'E. Geoscience Australia - Newsflash about the "Marree Man"
Reports of miracles involving people from all faiths (and those of none) are increasingly reaching the media. British author Benjamin Creme claims that these miracles are created by a group of highly evolved spiritual teachers - the Masters of Wisdom - who are beginning to take an active part in our daily lives to show us the way out of our current difficulties and bring the new teachings which will guide humanity towards its next evolutionary step. According to Creme their leader, named Maitreya - awaited by all religions under different names whether they call him the Christ, Messiah, the fifth Buddha, Krishna, or the Imam Mahdi - was interviewed on a major American network in January 2010, the first of many such interviews which will be given in the USA, Japan, Europe and elsewhere, bringing His message of hope to the world. Benjamin Creme writes: "Over many years Maitreya and his group of Masters have saturated the world with miracles. All religious groups look for signs. It is through the signs that they know the teacher is in the world or is coming into the world. You only have to keep awake and you will see that signs are everywhere. In every country in the world, in every religious setting, there are signs of one kind or another." Around Christmas in 1996, a 50-foot-high and 35 feet wide image, in bright colour, of the Madonna and child, appeared on the windows of a downtown bank in Clearwater, Florida, USA. Millions of people have since come to look and pray in front of the "building of the Virgin Mary". Eyewitnesses are talking about a very spiritual and peaceful atmosphere at the site. But many who have come to view the image do not need to be convinced of its authenticity. "It was like you're in an angel's arms," said one visitor. After vandals threw an unknown liquid on it in Spring 1997, the rainbow-coloured image apparently even repaired itself within two weeks. "We're not able to explain how the shape appeared or why it appeared. It could be an accident or maybe it's divine intervention." Carlo Pantano, a professor of materials science and engineering at Pennsylvania State University, said: "We can try to explain it, but not who controlled it or why it happened here at this time." Mysteries of the World: Unexplained Wonders and Mysterious Phenomena. World of the Unexplained: An Illustrated Guide to the Paranormal. 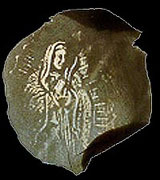 Since 1991, a young Filipino man, Carmelo Cortez, has had numerous experiences of the Madonna and is able to manifest detailed images of the Christ, Mary, and others onto rose petals. Healings have also been associated with these phenomena. After a few moments, we were asked to take a look at the petals. To our astonishment, what were originally plain white rose petals had now on them the image of the crucified Christ." Hasnah Meselmani, a girl from Lebanon, received world-wide media coverage after she had started crying small crystals tears from her left eye in March 1996. Even though the crystals are sharp enough to cut paper the eye of the girl has not suffered any injuries. A two week examination by a local eye specialist acknowledged the phenomena but did not supply an explanation for it. So her father took her to another eye specialist, Dr. Salomoun from the American University Hospital in Beirut. He was also not able to explain the phenomenon. During her observation even more crystals oozed out of her eye than usual. Now her case became public: television stations, magazines and newspapers flocked to the house of the Meselmani family to meet the girl with the crystal tears. So in October 1996 numerous television stations around the world showed pictures of Hasnah and the crystal tears. Since nobody found an explanation for it, the story - handled as rarity - was soon out of the headlines again. Hasnah says that she was visited by a man dressed in white sitting on a white horse. He said she needn't be afraid and introduced himself to her as "messenger from God". He led her to understand that it was he who had been behind the crystal tears, and that all went according to God's will. Hindus and Muslims all over the world are discovering holy signs which are formed by seeds in fruit and vegetables. There also reports about holy signs on beans and eggs. On 20 February 1997, for example Mr Sidat, a fruit and vegetable wholesaler and chairman of the Madina Mosque in Hackney, north London, on slicing an aubergine was amazed to discover that the seeds spelt out the Arabic script for 'Allah'. In South Dakota, USA, in the period of 1993 till 1996 five white buffalo calfs were born, four of them consecutively in a period of four months, thereby fulfilling the prophecies of native Americans tribes. The chance for a white buffalo is only about one in six to ten million [There are roughly 130,000 bison in North America today]. "For us, this would be something like coming to see Jesus lying in the manger", an Oglala medicine man, has commented. "Great changes are ahead of us - a better world." The first of these calves - called "Miracle" - even changed its color: Upon its birth it was white, then it changed to red, dark brown and yellow in the end.